“Unable to Open Item” error, suggesting I re-download the books from Amazon. I tried transferring the files again and again, but it didnt’ help. Some of the books were mobi files while others were “AZW` (which I got from אינדיבוק) and all of them opened fine on my computer. Finally, I followed an advice from a comment in the KindledFans blog, and converted the files to AZW3 (the original comment suggested mobi but AZW3 works better with Hebrew). After converting, I moved the files to my Kindle and they opened just fine. This entry was posted in Tips and tagged Kindle on December 20, 2014 by Guy. I’ve decided to compare the looks of four, freely available Hebrew fonts, on the Amazon Kindle Paperwhite. This entry was posted in Tips and tagged Hebrew, Kindle on April 21, 2014 by Guy. 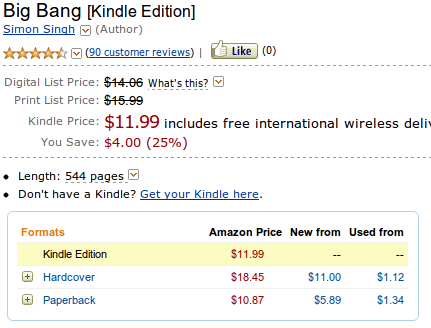 As you can see, Amazon sells Kindle edition for higher price than a paperback. This book of course isn’t the only example for this ridiculous pricing method, and if one browses the Kindle store he will surely find more. This really upsets me, as there is no honest reason to price an electronic edition higher than a real dead-tree paper edition. In both cases, the author and the publisher get their royalities and share of the profits. But the Kindle editions doesn’t have many related expenses, like storage, transportation (from the publisher to Amazon), and above all printing costs. I don’t know who is to blame for this absurd thing, Amazon or the publisher (or even both). But the few things I know are that this bad for everyone, the customer because he pays more and Amazon/publisher as in the long run, this encourages piracy as the customer feels he’s being unfairly treated thus he will be more willing to play an unfair game as well. This entry was posted in Uncategorized and tagged Kindle on December 30, 2011 by Guy.